The second article I would like to write is about Harry Champion. You may have heard of him or some of the songs he sang, such as 'I'm Henery the Eighth, I Am' or 'Any Old Iron'. 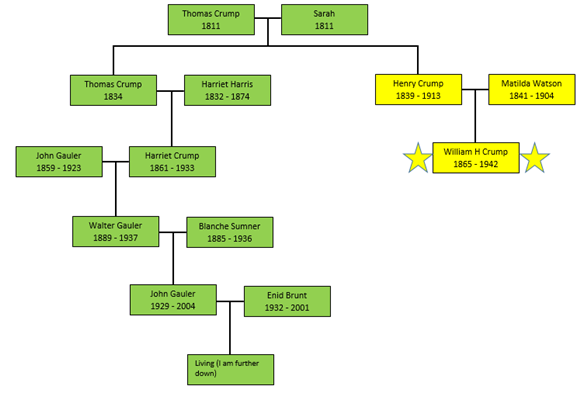 Born as William Henry Crump to Henry Crump and Matilda Watson in 1865. He was the second of three children who grew up in Bethnal Green. His siblings were Matilda, born 1861 and George, born 1867. He started performing under the name William Conray at the age of 15 before changing his stage name to Harry Champion in 1887. A few years later he gave up his 'Blackface Act' and bought the rights to the song 'I'm Selling up the 'Appy 'Ome', which would usually accompanied his hornpipe dance. He made his West-End Theatre debut in 1890. In 1893, he added the song 'When the Old Dun Cow Caught Fire' to his act. The Entr'Acte said, "Champion is a comic singer who is endowed with genuine humour, which is revealed in his several songs, of which the audience never seems to get enough". In 1898, he adopted a quickfire approach to his songs. Saying, "At one time I used to sing songs with plenty of patter but I changed the style for a new idea of my own and started 'quick singing'. I think I am the only comedian who sings songs all in a lump, as you may say". He became his most popular between 1910 and 1915, this is when he sang his most popular songs, such as, 'Boiled Beef and Carrots', 'I'm Henery the Eighth, I Am', 'Any Old Iron' and 'A Little Bit of Cucumber'. As World War One broke out, his fame naturally decreased, however he did record the song 'Grow Some Taters' which was used by the British Government to promote the home growing of vegetables. He was forced into retirement in 1920. As well as entertaining, his business investment was in 'WH Crump and Sons', where he and his sons, William, Arthur (Victor) and Thomas, had a successful business by hiring out horse drawn carriages, which became known as Horseshoe Coaches. The business was later sold and renamed, 'North London Coaches'. Due to The Great Depression, his genre of entertainment regained it's popularity and he came out of retirement and in 1932, he performed at The Royal Variety Show. During World War Two he would sing to the troops, who found him a "splendid tonic"
On the 14 January 1942 he died of ill health and was buried with his wife Sarah, 10 days later.